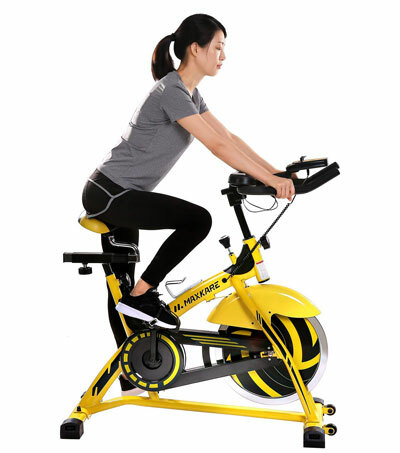 The MaxKare indoor cycling bike offers the same range of features as the Ancheer B-3008. It’s a bike made for home use and for spin workouts. 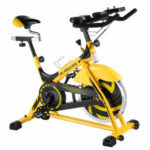 It’s an affordable trainer and can make a decent alternative to any spin bike, especially if you want to train at home. The MexKare bike features a frame made of steel tubing. It doesn’t offer the sturdiness and overall weight of a commercial-grade spin bike such as the Spinner P3 for example, but nonetheless, it still offers a weight capacity of 260 lbs (118 kg). The fully assembled bike is fairly heavy. It weighs approx. 92 lbs (41 kg) which is more than twice the weight of any regular bike. All this weight delivers excellent stability. Plus, both base bars of the bike are equipped with easily adjustable levelers. The bike doesn’t have a folding frame. However, once it is assembled, it is very easy to move and handle. Its front base features a set of wheels which facilitate its relocation. This indoor cycling bike isn’t extremely large. It is approx. 43″ (109 cm) long and 19″ (48 cm) wide. This being said, it can fit a small room or apartment, but still, it’s recommended to leave at least two feet of clearance all around it. It’s also recommended to place it on a mat. Although most of the bike’s frame is made of steel tubing, there still are several ABS plastic parts in its construction. These are the covers of the transmission belt and the brake pad, as well as other small covers. They don’t influence the overall sturdiness of the unit, though, as their role is to provide protection for these parts and also prevent any sweat from dropping on them. Most of the metallic parts of the bike are coated with a corrosion-resistant and abrasion-resistant paint. The main color used is yellow, with the seat and handlebar posts painted black. The seat slider assembly and the flywheel have a chrome finish. 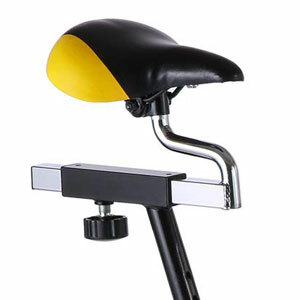 The MaxKare indoor cycling trainer is equipped with a fairly standard seat. The saddle is a bit wider than the average slim spin seat like the one included with the Spinner Edge, for example. Therefore, it provides a bit more contact surface and a bit more comfort during seated workouts. The attachment system of the saddle is collar-based; this means compatible replacements for it are widely available. It also means that you can slightly tilt it forward or backward. The bike’s seat is 4-way adjustable (up, down, front, back). It has a fairly long square slider which provides approx. 5″ (12 cm) of front to back adjustment. Plus, its upright bar also has several adjustment positions. This being said, the bike can adjust to accommodate comfortably users between 4’11” and 6’3″ (150 – 190 cm). Also, as we’ve mentioned above, it should be able to support users up to 260 lbs (118 kg) with no problem. The bike is equipped with a multi-grip handlebar. It features a short loop aero bar in the middle (to which the exercise meter needs to be attached), and two longer side grips. This being said, it can provide a race grip, a close parallel grip, a standard grip and more. The handlebar features two elbow pads placed at the base of the longer side grips. This feature is quite a plus as many exercise bike in this price range do not offer it. The side grips also integrate stainless steel pulse sensors. The handlebar only offers 2-way adjustability (up, down). Its upright bar has several adjustment positions and the adjustment is done via the large knob at the front, similar to the ones on the seat. 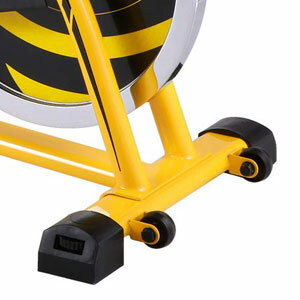 The MaxKare indoor cycling bike is equipped with a standard friction resistance system. It integrates a felt pad which is attached to the tension knob on top of the main tube of the frame and concealed by the top front cover. This brake pad comes in contact with the flywheel from above as you turn the knob clockwise. The bike’s resistance system does not have pre-determined tension settings like most magnetic bikes. You simply tighten the knob until you get a satisfying level of pedal resistance. Also, since this brake system is fully mechanical, you don’t have to connect the bike to a power source and the console does not play any role in the resistance adjustment. The tension knob fulfills the function of an emergency brake as well. You can press it down to instantly stop the flywheel from spinning. This may actually be necessary as the pedals continue to spin for as long as the flywheel is spinning. The bike is equipped with an extra-heavy flywheel. It weighs 44 lbs (20 kg). It has a perimeter-weighted structure for an aggressive inertia which is great for spin workouts. It is also bi-directional; in other words, it gives you the possibility to pedal in reverse if you want. But when pedaling in reverse the resistance remains constant; you cannot coast on this bike as on a road bike that has a rear derailleur. The bike’s drive system integrates a heavy-duty v-belt. This being said, it does not require lubrication and the pedaling motion is whisper-quiet. The crankset features heavy-duty crank arms which can support the full weight of the user. Also, the pedals are made of metallic alloy. They’re also highly durable, feature a non-slip surface and toe cages for extra thrust during pedaling. However, they do not have SPD clips for special spin shoes. The meter unit included with this exercise bike features an LCD display (without backlight) which tracks the most important workout metrics, including time, distance, speed, calories, and pulse. It can only read your pulse via the handlebar sensors, though. It is not telemetric so it does not work with wireless HR chest straps. 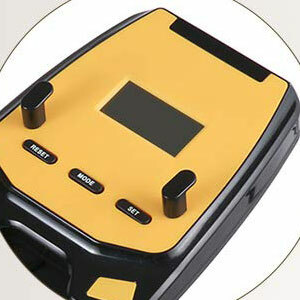 There are only three buttons on the meter which cover all of its functions. The Mode button allows you to select one of the metrics to view on the display, or to select the Scan function which rotates all the metrics. The Set button allows you to enter set-up mode and select a goal for time, distance, or calories. If a goal is selected, the display will show the remaining value and counts down to zero. And finally, the Reset button covers the reset function. If you press and hold it for several seconds, you can clear all the values on the meter to zero. The unit is battery-powered; it requires two AAA batteries. It starts up when you push one of its buttons or when you begin pedaling, but also has a sleep mode to which it will enter after a few minutes of inactivity on the bike. It also integrates a phone holder but does not have any online connectivity or a USB port to connect your phone. It’s a fairly basic unit. The main frame comes pre-assembled. In other words, the flywheel, the belt, the crank, and the resistance system are already attached to the frame with their covers in place. You only need to attach the two base bars, the seat, the handlebar, the exercise meter, and the pedals. This shouldn’t take more than 30-40 minutes. A basic toolkit for the assembly is also included. Once the bike is fully assembled, maintenance doesn’t require much. You may need to lubricate the brake pad from time to time with a bit of silicone lubricant (especially if emits a squeaking noise when in contact with the flywheel). Other than this, you only have to keep the bike clean and periodically check for loose bolts and parts. A tablet or phone placed on the holder will cover the console display. 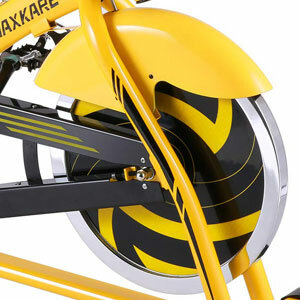 The MaxKare bike is an indoor cycling trainer designed for home use. It features a 44 lbs flywheel, a friction resistance system, a belt drivetrain, and a 4-way adjustable seat. It also includes a fitness meter which tracks the most important workout metrics. It’s a bike designed for spin workouts, great for light to intense cardio training, interval training, weight loss, leg muscle strength development, and stamina improvement. It’s also an affordable trainer, an excellent alternative to a commercial grade spin bike.